Collecting recipes for the bride at her bridal shower is a fun way to share traditional family recipes while also helping to get the young couple's feet wet in the kitchen. And even if they already hold a master's degree in cooking, I'm sure they would still love a copy of Grannie's Rice Pudding or Uncle Frank's homemade Sloppy Joe recipe. Sharing recipes with the bride is not a new idea but there's good reason why this time-honored tradition has held fast for so many years. Everyone loves it! The guests enjoy discussing the individual recipes they've brought along and the bride and groom get a wonderful keepsake that represents the blending of their family and friends that was brought about because of the love they share. 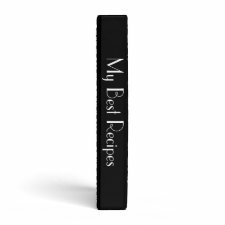 Years down the road this one of a kind recipe collection can and will be taken out and treasured time and again. In fact, this unique recipe collection just might become a family heirloom. That's why it's so important to plan ahead for the best way to collect, keep and present it to the bride. One way is to use a pretty recipe box and fill it with hand written recipe cards. To do this, you'll want to include a blank recipe card with each invitation you send requesting the intended guests to fill out the card with one of their favorite recipes and return it to you on the day of the shower. Here's a fun bridal shower recipe card poem that you could use for this purpose. It explains exactly what you want. Enclosed for you is a recipe card. To fill it in shouldn't be hard. or whatever it is you like to make. So don't forget this card on this special date. Fill it in now, don't hesitate. At the shower will be a recipe box to fill. Another really nice way to collect the bridal shower recipes is to use a custom binder that is personalized with the bride's name on it. For this, you could include a blank recipe page with each invitation but then they would need to be folded and the book could end up looking rather messy. 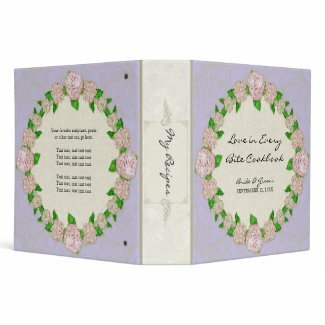 I find the best way to create this sort of cookbook is to ask each guest to email a recipe and then whoever is in charge, can print, or hand write these recipes out, maybe even laminate them for safe keeping and add them to the cookbook recipe binder and then present the binder to the bride on the day of the shower. Not only does this make for a wonderful gift, it's also something that can be passed around and admired by all of the guests. 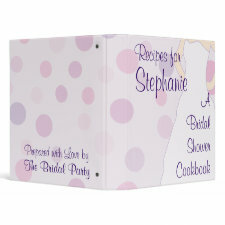 Here's a few of my favorite personalized bridal shower cookbook binders that are available at Zazzle.com right now. They're all easy to customize and personalize with the bride or couple's names, wedding date, or any thing else you'd like to add. 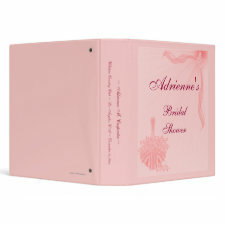 Click on your favorites to learn more or visit Bridal Shower Binders to see them all. Have you got another great way to share a recipe with the bride and groom? Do you have any unique ideas for presenting the collection at the bridal shower? Please feel free to add your idea here in the comments. We love hearing from our readers and your terrific idea just might help to make the bride's special day even better. Thanks! Photo and Cheese Soup recipe appear with thanks to ninnet who made their work available through a creativecommons.org license. Click photo to see the original source. It's appropriate time to make some plans for the future and it's time to be happy. I have read this post and if I could I desire to suggest you some interesting things or suggestions. Maybe you could write next articles referring to this article. I want to read even more things about it!